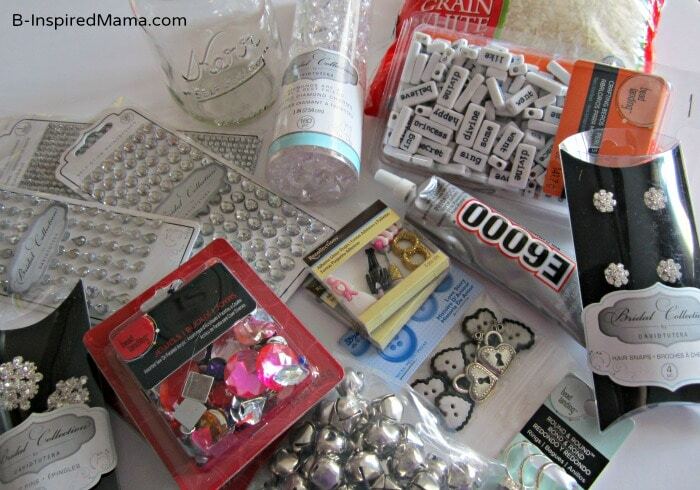 Arrange the various buttons, charms, rhinestones, and rhinestone snaps on a white sheet of paper. Photograph them and use a photo editing program (I used Picmonkey.) to add a border and text to the photo. Print on cardstock and laminate. Set aside. Use wire cutters to remove the pin back from the rhinestone pin. 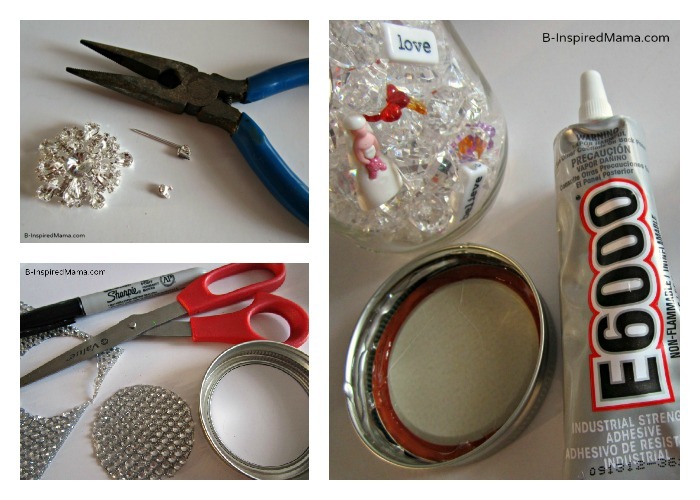 Use E6000 adhesive to attach it on top of the rhinestones on the lid. Fill the mason jar with the various buttons, charms, rhinestones, rhinestone snaps, and diamond cut accents. Leave a little space at the top so that the contents move around when the jar is shaken. Use E6000 adhesive to glue the lid on the mason jar. Let dry completely. Punch a hole in the laminated tag and tie it around the rim of the jar with your ribbon. 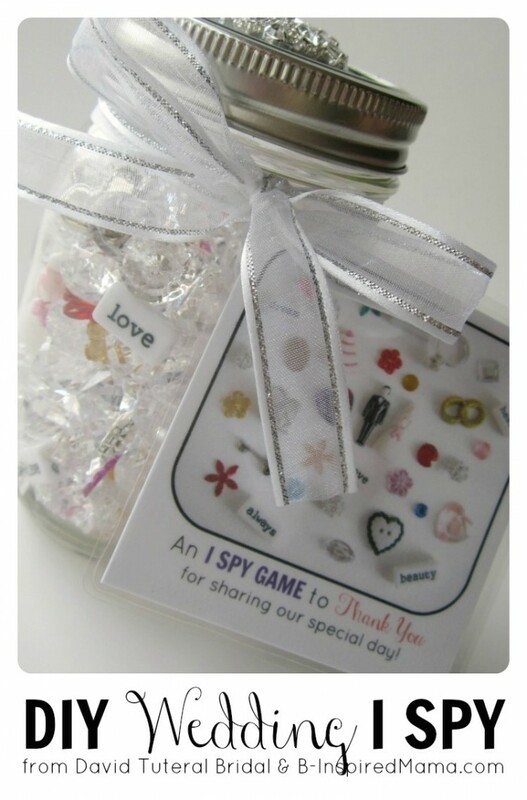 I think this Wedding I SPY Jar would make an awesome flower girl gift or kids’ favor. But my Priscilla is loving it even without a wedding! The sparkles and rhinestones from the David Tutera Bridal collection draw her in and make her eyes sparkle with delight. The David Tutera bridal collection includes: Affordable fashion accessories, unique décor elements, floral accents and other embellishments, all designed to help you tell your own special love story. Adding your own unique touch is a lot easier than you think! It’s all about turning ordinary wedding elements into something special. I wrote this post as part of a sponsored campaign with Darice and The Blueprint Social. The opinions in this post are my own. I love to link up with: Thrift Share Monday, Contest Corner, Made by Me Monday, Just Something I Whipped Up, Made by Little Hands Monday, Learning Laboratory Monday, Tasty Tuesdays, Frugal & Fabulous Giveaways, Tuesday Tots, Tip Me Tuesday, Get Your Craft on Tuesday, Made by Me Wednesday, Sugar & Spice Wednesday, Kids Get Crafty Wednesday, Give It Away Wednesday, The Mommy Club Wednesdays, It’s Playtime Thursday, Thursday Giveaway Linky, What Are Little Boys Made of Thursday, The Weekly Kids Co-op, Read Explore Learn Friday, For the Kids Friday, Kitchen Fun and Craft Friday, Bonggamom’s Friday Finds, Delicately Constructed Fridays, Freebie Friday, Pin It Friday, Show & Share Saturday, Share it Saturday, Super Saturday Giveaway Link-up, The Sunday Showcase, The Sunday Parenting Party, Around the Blogosphere, Afterschool Express, and Link & Learn Sunday. Im trying to find the item with the bride and groom in it..but cannot make out what product this is. Can you help. Thanks in advance! I found them at Michael’s Arts & Crafts. They are Recollections Adhesive Glitter Shapes. I hope you find some! Oh these are brilliant. What a fantastic way to keep children entertained at a wedding! Thanks for sharing on The Sunday Showcase. I’ve pinned to our board. This is adorable, and what a fun game/gift for kids at a wedding! This is so sweet. What a fantastic idea to keep the kids entertained at the reception. Very cute! Would keep the kids occupied too! I cannot tell you how much I LOVE this! The kids definitely need an activity to keep them busy and this is just darling! LOVE IT! Oh my goodness, that’s genius! I love it! What a clever, fun, thoughtful idea! This is absolutely adorable! And sooo creative! These would be fun for the kids table too 🙂 Such a great idea!